The migration of artists over time has had significant effects on both the nature of artistic expression at a given time and the economy of areas affected by migration. Artists, tend on the whole, to move to areas where they can afford to live whilst having extra income for an artist’s studio and be able to afford time to actually make their work. This often entails living in deprived areas. Currently the art market in Britain is focused largely upon just one section of Tower Hamlets and Hackney in East London, which extends from Limehouse in the South through Whitechapel, Central Hackney, on up to Lower Clapton, North Hackney and West across to Dalston, Kingsland Road and Old Street. 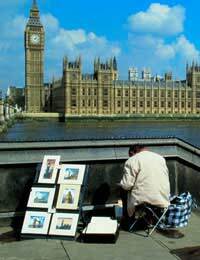 This square mile or so has a higher concentration of artists than anywhere else in the world. However, only 10-20 years prior to this there was a strong artist’s community focused around Soho and Piccadilly, Notting Hill and Ladbroke Grove in West London. Rising house prices slowly forced artists eastwards through to Clerkenwell, Farringdon, Old Street and the surrounding area and finally to Hackney Central. The simultaneous boom in the British art market, together with a new found confidence in the British economy has led to a major rejuvenation of parts of London’s East End as accommodation is adapted and restaurants and bars have been opened to cater for the growing international community of artists. This has left its mark most notably on areas such as Brick Lane which has been home to previous waves of immigrants, such as the French Huguenots, Jewish and Bangladeshi community. What was once a major textiles trade area, lined with Bangladeshi workers cafe’s alongside Jewish Bagel shops is now an artists hub gradually becoming ‘gentrified’ with the addition of boutique shops, bars and galleries. This has led in turn to the rise of house prices across East London. In a sense artists have effectively priced themselves out of the East End, with many now choosing accommodations in South London in the up and coming area around New Cross (where the top art school at Goldsmiths College is situated), Peckham and Camberwell. Looking at patterns of migration over the last century it is possible to discern where artists may migrate next. Economics is the primary motivator for the migration of artists, next to warfare (World War Two leading to the migration of the art scene from Paris to New York). Given the strength of the economy in Britain, and the relative weakness of many European economies, it can be assumed that London will continue to be a world cultural centre for a long while yet. However, instability and uncertainty caused by, amongst other things, terrorism, global warming and unpredictable world markets is liable to release London’s overall stronghold on the world art scene. Rises in rent across London, together with the relative low cost of living in East Germany and Eastern Europe may well see the art scene drift a lot further eastwards in one direction, whilst Saatchi’s growing interest in U.S. art may see a resurgence in the New York market in the west. The world art scene as a whole had been buoyed by the success of the British art market, and for this reason a resurgence in previously dull markets like that in Paris may be coupled with emerging markets as far afield as Romania and China. For this reason there may never again be a concentration of artists as focused as there is today in London, but it will remain the case that artists will gather and focus in low rent urban areas, and from a collectors point of view identifying the next trend could prove invaluable.